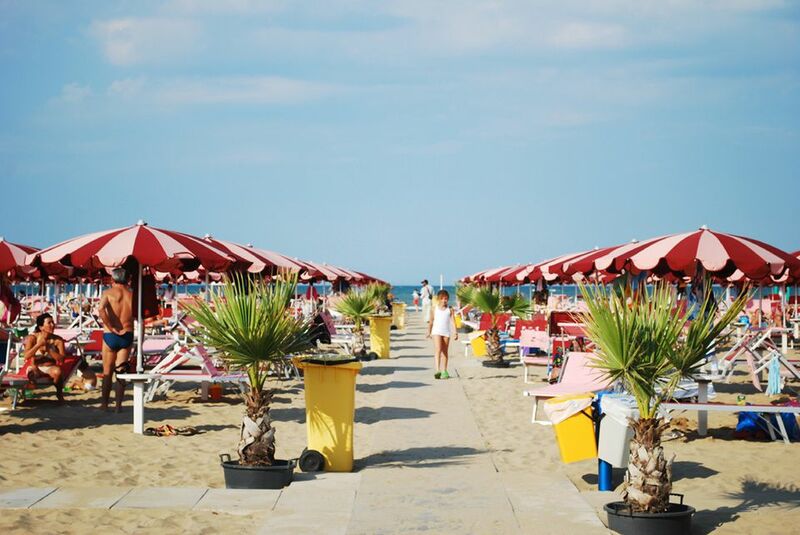 Rimini is the capital of Italian seaside tourism and nightlife – it's one of Italy's most popular beach resorts and one of the largest in Europe. It has 15km of fine sandy beach with top-rate bathing facilities. The seaside promenade is lined with restaurants, bars, hotels, and nightclubs. The city itself has an interesting historic center, Roman ruins, and museums. Film director Federico Fellini was from Rimini and is still honored here. Rimini is on Italy's east coast, about 200 miles south of Venice, on the Adriatic Sea. It's in the Emilia Romagna region of northern Italy (see Emilia Romagna Map). Nearby locations include Ravenna, the city of mosaics, the Republic of San Marino, and Le Marche region. Most hotels are near the seaside promenade, the Lungomare. Quality and amenities vary widely, from basic budget hotels that offer little more than a (probably) clean bed to four- and five-star palaces with all the bells and whistles. We like Hotel Corallo, a nice spa hotel by the sea in Riccione, to the south, and the less expensive family-run Hotel Eliseo by the sea in Iseo Marina to the north, both connected by bus to Rimini. Hotel National by the sea in Marino Centro has spa facilities and therapeutic treatments. During high season, particularly July and August, many hotels will offer weekly packages only. These usually include all or most meals, access to a private beach with lounge chairs and umbrellas, and "animation" – which may include a kids' club or activities, and nightly entertainment with musicians, comedians or group dancing. Marina Centro and Lungomare Augustore are ground zero for beaches and nightlife. Beaches spread north and south with those farther from the center more family oriented. A seafront promenade runs along the coast. Many of the beaches are private stabilimenti, with cabanas, umbrellas, and beach chairs for a day use fee. Rimini Terme is a thermal spa on the sea with treatment facilities, four heated saltwater pools, and a wellness center. It's set in a park with a fitness trail, beach, and playground. For rainy days or when you need a break from the beach, Rimini is rife with theme parks, old-style boardwalk arcades and, of course, lots and lots of bars and restaurants. Shops selling every imaginable beach toy, raft or game line the promenade. Gelato, pizza, typical Emilia-Romagna piadini flatbread sandwiches – they're all here, so there's no need to ever go bored, hungry or thirsty during your Italian seaside vacation. Rimini is on Italy's east coast rail line between Venice and Ancona. Trains also go to Bologna and Milan. The station is between the beach and historic center. Buses go to Ravenna, Cesena, and local towns. Federico Fellini Airport is just outside town. Driving can be difficult, especially in summer. Local buses run to the beach areas, train station, and historic center. The free blue line bus connects the disco area west of town to the main beach area. In summer, some buses run all night. Bicycling is a great option for getting around town and to the beaches, too. There are bike rentals around the beaches and some hotels offer free bicycles to guests. Rimini nightlife is high-energy, to say the least. The central beachfront area, especially along Lungomare Augusto and Viale Vespucci one block inland, is teeming with bars, pubs, nightclubs, arcades, and restaurants, some open all night. Rock Island is near the Ferris wheel on a little point out in the sea. The big discos are generally in the hills west of town. Some of them offer shuttle service and the blue line free bus connects discos to the main beach area. A night out in Rimini starts late and finishes in the wee hours – don't expect the music, dancing, and people-watching to really kick in until 11PM or later. Federico Fellini, the famous movie director, came from Rimini and several of his movies, including Amarcord and I Vitelloni, were set here. The Grand Hotel Rimini was featured in Amaracord. Murals commemorating Fellini and some of his movie characters can be seen in Borgo S. Giuliano, one of the oldest districts and a favorite haunt of Fellini. Besides beaches and nightlife, Rimini has a good historic center and is a city of art. Most of these sights are in the historic center. Your hotel should be able to provide you with a basic tourist map with these main sights marked. Roman Rimini dates from 268 BC and there are several ancient remains in good condition. The main town gate, Arco d'Augusto, was erected in 27 BC. There's a 62-meter long Roman bridge, Ponte di Tiberio, that was built in 21AD and part of a 2nd-century Roman amphitheater that once held over 10,000 spectators. Piazza Cavour is the main square, dating from the Medieval period. In the center of the square is a statue of Pope Paul IV and the circular Pigna fountain built in 1543 incorporating some Roman remains. Around the square are several interesting buildings including the 13th century Palazzo dell'Arengo, the town hall, the old fish market, and neoclassical theater, Teatro Amintore Galli. Behind the theater is the 15th-century fortress, Castel Sismondo, used for cultural events. Piazza tre Martiri is the site of the old Roman Forum. In the square are the early 16th-century Tempietto of Saint Anthony, and the clock tower, built in 1547 but with a clock face from 1750. There's also a 16th-century column commemorating Julius Caesar. The Malatesta Temple, Tempio Malatestiano, is Rimini's best monument and an important example of Italian Renaissance. A marble casing envelopes the original medieval church. The many art treasures inside include a Giotto painting from 1312, frescoes by Piero della Francesca, and sculptures by Duccio. Pope Pius II called it a temple of devil worship and condemned it. S. Agostino, a Romanesque-Gothic church, dates from 1247 and has important artworks and frescoes inside. Its 55-meter tall bell tower is the tallest in town. The City Museum, Museo della Citta , is housed in a former convent and 40 rooms filled with more than 1500 artworks. The archaeology section focuses on Roman finds and the Pinacoteca has Italian art from the 11th through 20th centuries. Cineteca, the film library, has a collection of movies related to Rimini and Fellini memorabilia. Italian movies are shown on Friday nights. Viserba, 4km away, is an old fishing port and popular holiday resort. The popular park, Italia in Miniatura, Italy in Miniature, has 272 Italian architecture scale reproductions representing all of Italy's regions. From Rimini train station, take bus number 8. Rimini is a top place to celebrate New Year's Eve in Italy with parties in numerous nightclubs and bars and a huge New Year's Eve festival in Piazzale Fellini with music, dancing, and entertainment, culminating in a spectacular display of fireworks over the sea. It's usually shown on Italian television. The International Pianoforte Festival, March through May, features free concerts by top pianists. The summer Sagra Musicale Malatestiana brings international artists for programs of music, theater, dance, and visual arts.